WHEN I say that credit of honour and awards goes to my language, Punjabi literature and to the characters of my novels and short stories. I have solid reason for my opinion. It is not only due to my humility or hypothesis. We know that our body and brain are a gift of Mother-Nature, and are responsible for every activity of man. Secondly, the sole medium of literature is the language which has been invented and developed by groups of men (or society) since the pre-historical period up to this day. If any author has coined a few words in his/her works, these are coined according to the pattern of language he/she learned and acquired. Thirdly, the subject matter of any literary work solely comes from the society concerned in which an author lives or observes with a sharp, keen intellect and with natural senses.The fourth factor of literature is the art of writing. One learns it from men of letters, educationists, teachers, and scholars of the world who have been thinking and creating the best works in every field of knowledge. After knowing these facts, how can an author or artist can claim that I have done it? So out of whatever I have achieved in the field of literature, at least three-fourths of the credit goes to the few factors I just mentioned, and only one-quarter of it may be termed as mine. FOR Gurdial Singh, the recipient of Jnanpith Award for 1999, it has, indeed, been an arduous journey through life. However, when he talks about his life and works, its in calm, measured tones, quite contrary to the turbulent life he has had. While travelling to Jaito, I wonder, if a man walking through his sarson fields or another hunched over his carts wheel or yet another hammering out iron sheets realises that someone in their vicinity has won the nations highest literary award. Gurdial Singh was born to a carpenter, Jagat Singh and Nihal Kaur, on January 10, 1933 at Bhaini Fateh, a village near Jaito. The land surrounding Jaito was plagued by acute water scarcity. People collected rainwater or ferried it across on the camels in mashaks over long distances. In winters, Jagat Singh made wheels for the bullock carts, while in summers, he moulded trunks and water tanks out of iron sheets. That meant working for more than 16 hours a day, beginning much before sunrise and finishing much after the sun had set. So, when he was made to leave home and join his father, he hated it. It was as though everything about manual labour revolted him; long hours of work, his own bent of mind and his frail constitution. Occasionally, just to be able to escape the rigour of labour, he would slip away to the gurdwara, something he continued to do for over four years. Then, he started painting. Looking at his canvases, it is hard to believe that it is the work of someone who did painting only as a passing childhood fancy. It was his meeting with another enthusiastic young lad, S. S. Padam that led him into teaching children. Had it not been for the constant guidance and inspiration of Madan Mohan Sharma, the headmaster of a middle school in Jaito, Gurdial Singh wouldnt have been able to "improve his qualifications." It was Sharma who persuaded Jagat Singh to send his children to school. Masterji lived not very far from his house and would often tell Gurdial that he could drop by for whatever help he needed. He was the one who goaded him into doing Matric first and Gyani later. In those days, when a skilled labourer used to earn no more than Rs 2 a day, Gurdial Singh and his father managed to notch up as much as Rs 20 a day. When he left work and opted to study and teach on the side, (at Rs 30 a month), his father was naturally quite upset and thought it to be extremely foolish, even futile on the part of his elder son to refuse work and opt to study. Balwant Kaur, someone his age, he chose to become a provider while still working to educate himself. "My wife always stood by me, like a rock. She never complained, never made any demands. If Ive been able to do some meaningful work, its because of her support." Though money was always in a short supply, Balwant never badgered or goaded him. She even sold off her saggi phuls (special ornaments worn by the women on their head, plaited neatly into the hair, often treated as symbolic of her self-respect). Now as he reflects on their relationship together, silent tears rise to his eyes. Fighting them back, he smiles in a rather artless manner, adding; " Now all this is something I cant really say to her face without getting emotional." It was master Madan Mohan, again, who took him to a colleague, an inspector of schools, for a job. It was in Nandpur Kotra that he got his first job as a schoolteacher at a salary of Rs 60. To be able to get a running grade, it was imperative for him to go through formal training, which meant taking leave without pay. In 1962, he became a teacher of Punjabi in a village. Masterji continued to goad him to study further and so it was B.A by parts, first English, then history. An introvert, who refused to share his innermost thoughts and tensions with anyone, Gurdial Singh was compelled to write because he wanted to come to terms with the complications and hardships of life. Writing was a therapy, and it was in writing that he found immense satisfaction, even solace. Though he had read the classics, he never wanted to write like anybody else. Because of his own life, he could identify with those who didnt even get one square meal a day. Leave alone spare a thought for those who lead a wretched existence, the middle class, he believes, does not even treat them like human beings. The attitude of the middle class is marked by contempt. It was an extremely realistic portrayal of " a slice of life" that got him early success. Even stories that were "rough" started getting published. It was in 1957 that he published his first ever story called Bhaganwale in Panj Darya, a magazine edited by Prof. Mohan Singh. 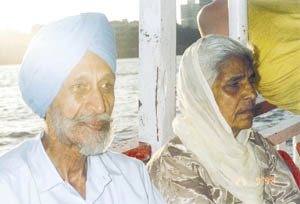 Most of his stories were published in Preetlari, edited by the redoubtable Gurbaksh Singh. first discover and then hone his own distinctive literary voice. Artistically, too, he did not want the work to be flawed, perhaps thats why he worked and re-worked his novels. Even today, he has four different versions of Marhi Da Deeva lying with him, which he wrote over four years. Most of his characters, he says, are drawn from the persons he has either known or heard about. Of course, they are no more than models as fleshing out is entirely his own and so is his fictitious re-creation. For Gurdial Singh, literature is not literature unless it springs from life. The writers job is to instil into people a consciousness and even sensitise them. Writing should create a bonding that makes sharing of joys and sorrows possible (sukh dukh di sanjh). Literature should compel the reader to think, as its purpose is not to satisfy but disturb. When a friend told him that he couldnt sleep for three consecutive nights after reading Parsa, Gurdial Singh took it as a compliment, as a sign of his success as a story-teller. Literature that does nothing except fulfil the gaps and fissures in life, providing easy escape routes is dangerous, he emphatically says. According to him, what is, indeed, damaging as well as disappointing is the tendency to write just about anything for fame or money. Often such writing celebrates trivia, focusing attention on marginal issues. A vast majority that leads such a wretched existence cant be wished away so easily. More than anything else, its the basic problems of life that count. For instance, how can one ignore the economic fallout of the political instability upon the common people? Perhaps thats why Gurdial Singh feels that those who are being made into stars by the media are not writers but only "newsmakers". Under the glare of media strobes, every little gesture or statement begins to appear both appealing and meaningful. This engenders a sense of complacency, even a false consciousness. Often, the ruling elite, who claims to redress the problems of the people, never gets to face a real crisis in life. Besides, if you can win, using money or devious means, why address real problems at all? It is only when people become aware and hold the governing class accountable for their (mis)deeds or take them to task can the things ever hope to change. Notions of so-called " modernism" can hardly be applied to our set-up, which is still semi-feudal. All "isms" emerge from the social system, all that constitutes the matrix of our socio-cultural milieu. If an "ism" remains an offshoot of pure subjectivity, then it is meaningless. If European writers talk of "alienation", it is authentic because this experience is a by-product of the widespread destruction wrought by World War II, which crushed all familiar parameters of life. On being asked about the major influences upon his writing, Gurdial Singh has said more than other writers that he was inspired directly by life itself. Russian writers did leave a deep impress upon his mind, though. His favourite novel is Tolstoys Anna Karenina. As a storyteller, he has always had great admiration for Chekhov as well. " In his novels, Tolstoy pays a great deal of attention to tiny details, fleshes them out with great care. What to talk of his characters, even his dogs and horses have a distinct vigour and intensity." It is this vastness of life that has been a source of perennial interest to Gurdial Singh. Among other books he made a special mention of are Irving Stones Lust For Life , Steinbacks The Grapes Of Wrath, Phaneshwar Nath Renus Maila Anchal, Prem Chands Godan and Yashpals Divya. When asked how far idealism is relevant in this day and age, Gurdial Singh was quite definitive that in a transitional stage, a writer has only greater, not lesser responsibility. With that milieu changing so fast, inhuman values are coming to the fore and so are anti-human attitudes. For Gurdial Singh, the only test of good writing is its ability to survive the onslaught of time, even transcend it. Baba Farid, he says, is a living author though he lived in the 13th century and his work is confined to just 122 shlokas in 15 pages. Of course, he is aware of the pot shots critics often take, saying, "Purane zamane diyan kahanian likhi janda hai", or how his friends occasionally scoff at the Padamshri, asking him, "Kagaz farah ditta!" because they feel that if a President honours, he gives no less than Rs 5 lakh to Rs 7 lakh in hard cash. He thinks that awards dont affect the tenor of his creativity, though he wouldnt be human if he were not to feel happy on receiving them. On liberalisation, he definitely has strong views. He feels that common man is, undoubtedly, trapped by the glitter of consumerism but when the intelligentsia also gets sucked in, it is something to worry about. Can we afford to remain perched on an island, cut off from reality? We cant really afford to behave like pigeons that shut their eyes the moment they see a cat coming in. Meeting Gurdial Singh is somewhat like meeting a whole way of life, an ethos, a culture that lives inside him as much as it lives through his works. 3. Rete Di Ikk Mutthi 1967. 7. Anhe Ghore Da Daan 1976. 8. Pauh Phutale Ton Pehlan 1982. 2. Chan Da Boota 1964. 4. Kutta Te Aadmi 1971. 6. Rukhe Misse Bande 1984. 11. 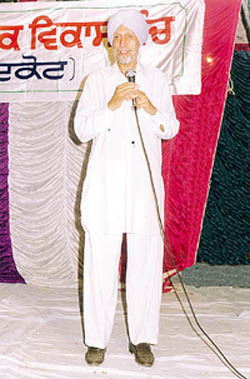 Kareer Di Dhingri 1991. 12. Meri Pratinidhi Rachna 1992. 12. Jnanpith Literary Award 2000.